Launched in 2000 by Danza's late founder Andrea Del Conte, this program started out as a partnership with the Lower Eastside Girls Club (LESGC) and expanded its offering through a unique partnership with Hudson Guild and Lotus Music & Dance. Funded by the NYC Department of Cultural Affairs and individuals, this program offers girls and boys ages 8-16 free training in Flamenco, Spanish Dance, and Mexican Dance, and performance opportunities at various venues in and around the city. Now in its nineteenth year, the program serves girls and boys from Hudson Guild, El Barrio, and Eubie Blake School in Brooklyn. Previous partnerships include the Lower Eastside Girls Club (2000-2015), and the Beacon Program of the Goddard Riverside Community Center (2016). Children study year-round at these venues with Yloy Ybarra and Danza’s teaching artists. The Flamenco Children's Training Program is geared toward the individual within a larger community matrix. The classes and its instructors emphasize the merits of becoming a leader who has confidence and a self-expressive ability. This comes from an awareness of their cultural roots and heritage and their body. The Flamenco Training Program allows Danza España to share its passion and professional experience with the next generation of dancers and citizens while also encouraging the growth and development of young people. Danza España’s arts education programs are excellent. As a member of Young Audiences of New York City (YANY), and Symphony Space, Danza’s company artists are trained to work with students of all ages and backgrounds and to pass their knowledge on to them. This aids in preserving and disseminating the cultural heritage of Spain as well as introducing young people to the endless ways in which the arts can enrich their lives regardless of their background. 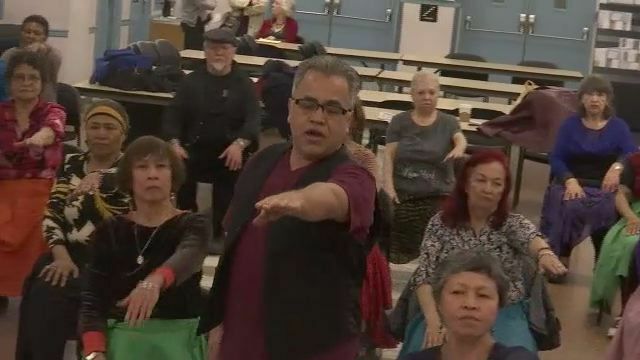 Over the past 37 years, Danza Espana has conducted lecture demonstrations and workshops for school children of all ages throughout the boroughs of New York City. A proud recipient of a 2018 and 2016 SU-CASA award, Danza España held two artist residencies at Encore Senior Center in Manhattan’s theater district. Taught by Artistic Director Yloy Ybarra and Danza’s teaching artists Alda Reuter and Gisele Saad Assi, we offered classes in Spanish Dance, Mexican Dance, and Latin Dance to approximately 20-25 participants, who also performed for their friends, family, and the general public at the end of the residency. Our special thanks to the New York City Council, NYC Department of Cultural Affairs and the NYC Department for the Aging for supporting this program. And our heartfelt thanks to all the staff of Encore Senior Center and our wonderful dancers. Their great energy and love for dance made these residencies truly special!